This month the Nova Scotia Gambia Association (NSGA) has been coordinating a round of Peer Health Education (PHE) training sessions. One of their longest-running programs, these trainings lay the foundations of skills needed for youth to become strong leaders in their schools and communities. This round of trainings are taking place in schools all over the country, run by regional coordinators, with some help from drama troupers. 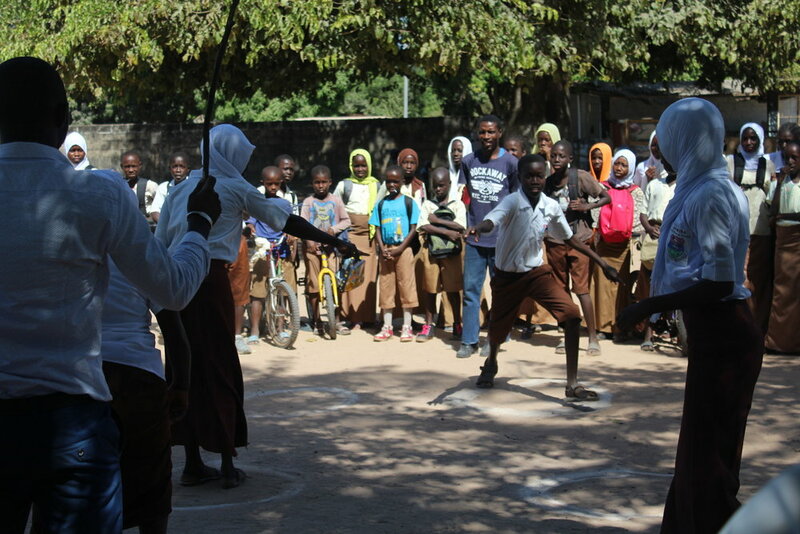 I recently had the opportunity to visit, document, and learn from trainers and students at three different schools in the Kombo and Brikama areas. A group of approx. 20-30 students and 1-2 teacher coordinators are chosen by each school to participate in a three day immersion program which will equip them with the basic tools they need to start a PHE club - or if one already exists, to maintain it by training younger students to take over as older ones age out of it. This helps to ensure the sustainability of the program. The first half of the training is a marathon session about a specific health topic - in the case of the schools I visited, they were either learning about a) Malaria OR b) HIV/AIDS + Positive Life Skills. Students learn the facts and science behind diseases, as well as the most effective way of preventing them, especially in a Gambian context. Next they discuss common myths, misconceptions, and cultural barriers to prevention, and the best ways to counter them in order to promote positive behavioural change. The second half of the program goes deeper into aspects of behavioural change, but focuses mainly on a whirlwind tour of the foundations of theatre and drama - providing students with concepts to “educate and entertain.” Topics range from voice projection to body language to knowing your audience and how to best tailor your performances to it. It is during this part of the training that new participants get their first trial by fire - through short classroom presentations or by seeking out their peers during break in the schoolyard, PHEs go out in small groups to put their new outreach skills to the test. Afterwards, they come back together to discuss how it went and workshop the aspects they want to strengthen in a collaborative way. With their heads crammed full of new information, the PHEs now have a base of knowledge and the teacher support they need to go forth and continue their work. After a training is complete, NSGA monitors the progress of the schools to make sure they are staying active and have what they need. The PHE trainers use a variety of teaching methods with their students - there were regular class lectures, facilitated discussions, breakout sessions with presentations, role-playing exercises, ice breaker games and other team building activities. These methods not only ensure that students are understanding the information; they are also giving the group a chance to work and build confidence together. Another effective approach that all the trainers used was using their own personal stories as examples when teaching, or first asking the students for their own. By way of example, in one session a trainer asked who in the class used a bed net to prevent Malaria at night - he then asked the students why they or their family members did or didn’t use them, which led to a long list of answers and a fruitful discussion about proper use of bed nets. This approach enables the trainers to better relate to the students, and to workshop common solutions and potential talking points that they know will be relevant. In another school, this same question about which family members use bed nets was used to highlight the wider societal and economic impacts of Malaria - ranging from the cost to the healthcare system to how a parent being sick can impact family income, or affect their own education. This approach exemplifies how NSGA’s programming is focused on empowering youth and communities to have the information they need to achieve individual and collective goals. For students new to the program, most were visibly engaged and soaking up all the information they received. Many that I talked with told me that they now had a much better idea of how diseases work, or in the case of life skills how their body systems work, and were keen to dispel myths and share info with their friends. Many were able to confidently connect individual health with community health and wellbeing, often repeating NSGA’s motto that they wanted to “learn and teach others.” They recognized the importance of the work they were signing up to do, understanding and ready to take on the responsibility of being strong role models. This cohort will join the many others that have been trained by NSGA over the years, including all of the trainers themselves. Together, they are building a network and legacy of strong and confident young leaders. Krystal Lewis is working as a Media Intern with Nova Scotia Gambia Association in Gambia.